I've taken the minimalist approach to skincare to the extreme this past 12 months. I've eschewed serums, toners, eye creams, night moisturizers and scrubs after finding relatively little success with them. I have to admit that I'm also essentially lazy and have little or no discipline when it comes to sticking to a proper skincare routine. However, the switch to natural products seemed to have a positive effect on my skin regardless of the lack of skin care products crowding the bathroom counter. While my skin no longer looks like a raisin after religiously plumping it up with Trilogy Rosehip Oil, I've noticed that my pores are the size of craters and there's a slight forming of jowls along the jawline as well as fine lines around the eye area. I'm also approaching 40 faster than a speeding bullet train. 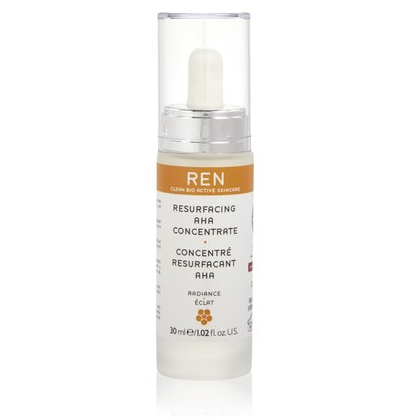 I was at a local store a few days ago and stumbled upon a bottle of Ren Resurfacing AHA Concentrate at 50% off. I thought it'd be a good time to try to combat the signs of aging. I've used a few of their products and have found them amazing. That night, I massaged 3 drops of the serum onto my face, neck and chest. There was a slight tingling but that soon settled down. A few hours later, the hubs saw my face and exclaimed "huh... what happened to your face?Hey! Did you do something to it?" Grunt. Followed by a closer look muttering "it looks good". Which is male talk for "sweetheart, your face looks luminous tonight." Seeing that the hubby tends to be oblivious to these things (I could've worn an old top 20 times and he still thinks it's new), I guess that's saying something. The next morning, I've noticed that my pores appeared visibly smaller, the skin was radiant and glowed. Most importantly, my fine lines looked almost invisible. I've now used the serum for 4 nights in a row now and am extremely impressed with the results. I don't bother with the foundation now and just use a little concealer in the morning. That's one whole minute shaved off my morning routine! The Ren Resurfacing AHA Concentrate is completely natural. According to the blurb on REN website, it contains glycolic, lactic, tartaric and citric acids to promote regular cell turnover, While it isn't cheap by any means, a little goes a long way. Conversely, if you consider how expensive (and painful) chemical peels are, this is a far safer and affordable option. The Ren Resurfacing AHA Concentrate is available here for £30 in the U.K or here in the US for $45. Oh my god - I'll take 10 bottles please. Since blogging, I have obviously started taking photos of myself and have been most displeased with any which have my face in. Like you say, you hit 40 and 40 hits your face. I am off to Harvey Nicks to get my bottle . Sue, this is why I simply cannot model any clothes. I can't show my face. AND I haven't quite learned how to apply eye make up either. Wow that sounds amazing Marlene.. I'm on that speeding bullet train with you! haha - am tempted to go try this out for myself; have used other Ren products before and they're great! wow sounds like a miracle! ANd i just read your comment above and yes you can! I bet you look amazing!!!!! I would just die to see you in one of your fab outfits!!!!! xO! Sounds like an awesome product :) !!! Impressive! Can it be used on its own without moisturiser? One for my shopping list when I finish whatever I'm using. Bloody hell, is this a miracle product or what? I strongly believe that we can't do a lot to combat the signs of ageing just cleanse, tone and moisturise but after seeing Horizon last week there is so much more we can do, regarding 5* sun protection (which I blogged about) and to eat less sugar! Yes really, now I can see all those Donuts have taken their toll and not just on my middle aged spread! This is a precious review, Marlene. I stopped using serums a few months ago since I was not noticing any difference on my skin. But I'll consider this one from Ren. I never used this brand but I've always read good things about it. Maybe it's time to give it a try. Hmmm...this looks like an interesting product to try. I like the ingredients. I think summer is a good time to take minimalistic approach to skin care. I've used REN products, their Clearcalm3 line is really good. I've heard good things about this mask, but AHA containing products break me out so unfortunately I can't try it out. SOUNDS FABULOUS! AT 42, I HAVE TO RELIGIOUSLY SPEND MORE TIME ON SKINCARE AND LESS ON MAKE-UP SO NEWS/REVIEW LIKE THIS IS GOLD TO ME.. THANKS! You know a product is good when the husband notices a difference. I MUST check this out as it has the glycolic acid which seems to work wonder for me in a previous skincare brand. The price is much more affordable too, thank you for sharing the goodness. I am never a girl who has a long list of skincare product my whole life. My daily products have always been 1) sunscreen 2) cleanser 3) night moisturizer 4) eye cream (which is optional as of late). Toner, scrub or mask are of rare subject due to my laziness. At 33, i need to put much more efforts into taking care of my skin though. Dont wanna wait until it is too late. Woohooo i will be 40 in 7 years, pretty scary to think about it. I love your philosophy on skin care. About a year and a half ago, I switched about 80% of my skin care to all natural or organic based products and have really noticed a difference. That's a pretty decent price for getting rid of wrinkles - must try and see if I can source that! um, you sold me on this product!! Smaller pores + radiant skin = sign me up!! i've used REN samples and really like them, but never committed to their skincare. but, this....i might have to try it out! thanks for sharing!! I love REN's Glycolactic Skin Peel and Moroccan Rose Body Oil so will definitely be giving this a try! Great review, your hubby's response is hilarious! I used to do chemical peels and find them effective (if done in moderation). But now, it is difficult to find time to visit the doc and I think this is something I would like to try. AHAs do a wonderful job in evening out skintone. I bought some of this yesterday Marlene on your recommendation. My skin is looking good today but time will tell I guess.